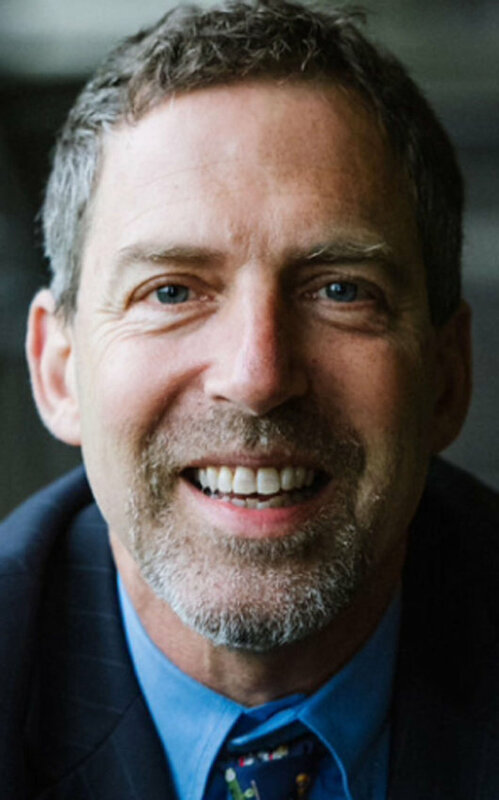 Ira Saligman, 53, aviator, philanthropist, investor. Ira Saligman’s passion for flying was realized when he became a naval aviator. After the Persian Gulf War, he pursued philanthropic causes. On July 25, 2016, about 0945 eastern daylight time, a Yakovlev Yak-11, N5940, was substantially damaged by fire after landing at Allegheny County Airport (AGC), West Mifflin, Pennsylvania. The commercial pilot was fatally injured. The airplane was privately owned and operated by the pilot under the provisions of Title 14 Code of Federal Regulations Part 91. Visual meteorological conditions prevailed, and no flight plan was filed for the personal flight, which originated at Chester County Airport (MQS), Coatesville, Pennsylvania, about 0830. 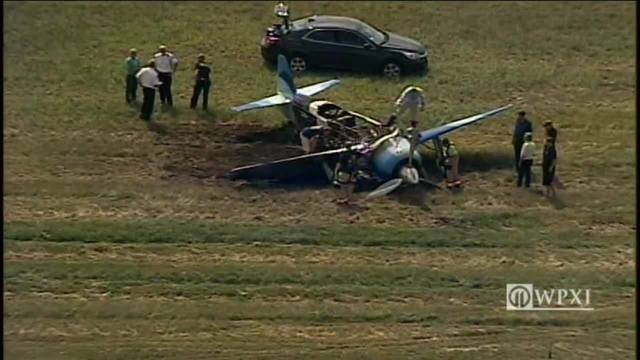 The accident occurred during the first leg of a multiple leg cross-country flight to the Experimental Aircraft Association (EAA) fly-in and convention (EAA AirVenture Oshkosh), held at Wittman Regional Airport (OSH), Oshkosh, Wisconsin. According to air traffic control information from the Federal Aviation Administration (FAA), the pilot first contacted the tower controller at AGC when he was about 20 miles east of the airport and advised that his transponder was inoperative. The controller instructed the pilot to "proceed straight in" for runway 28 and cleared the airplane for landing. The pilot acknowledged the landing clearance and advised that he would be going to Corporate Air and would need progressive taxi instructions. Security video footage showed that the airplane touched down about 2,000 ft down the runway. The pilot was then advised by the tower controller to "make any left turn" and to contact ground control. After the airplane rolled past taxiway C, the pilot asked if he could turn the airplane around on the runway. He was given permission to do so and was again instructed to contact ground control. The pilot then advised he was switching frequencies to ground control. As the airplane turned and its right side became visible to personnel in the control tower, the ground controller advised the pilot that there was a fire under the airplane's wing. The airplane continued to turn left until it traveled off the side of the paved surface of the runway and rolled through the airport infield until it came to rest near taxiway G, with smoke and flames emanating from the right side of the airplane. The pilot egressed and was transported by airport personnel via golf cart to a nearby hangar where a helicopter emergency service operator was based. Paramedics at the hangar began treating the pilot, who was clad in shorts, a T-shirt, socks, and tennis shoes, and had not been wearing his fire-retardant flight suit, gloves, or helmet. He had visible thermal injuries over 62% of his body. The pilot was subsequently transported to the hospital where he succumbed to his injuries about 6 days later. According to FAA records, the pilot held a commercial pilot certificate with ratings for airplane single- and multi-engine land and instrument airplane. 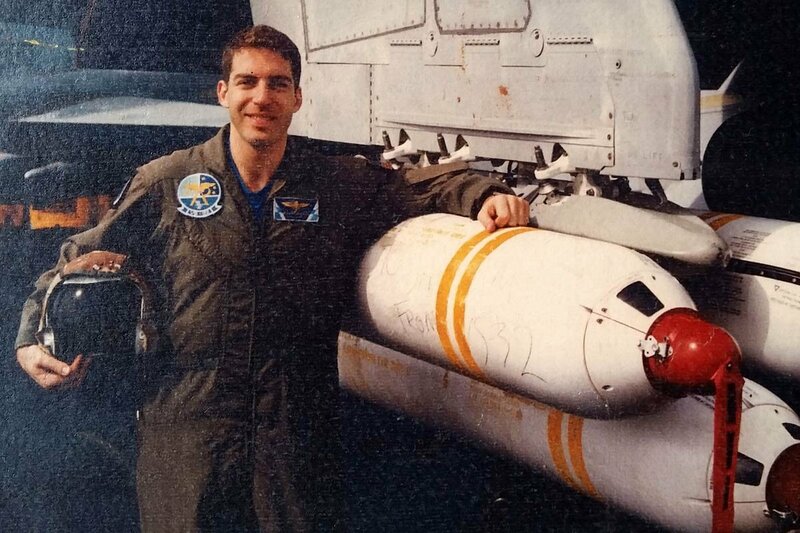 While in the United States Navy, he had flown the T-34, T2C, TA4J, and S3B. He had owned and operated a Yak 50 and 52 and held a letter of authorization from the FAA to operate the Yak-3, Yak-9, and Yak-11 as pilot-in-command under visual flight rules. His most recent FAA second-class medical certificate was issued on April 5, 2016. He reported on that date that he had accrued about 3,100 total hours of flight experience. The accident airplane was a two-seat, low-wing, military trainer equipped with a variable pitch propeller. The main landing gear was retractable, and the tailwheel was fixed. The flight controls were not boosted and were conventional in operation. The elevator and ailerons were controlled through push-pull rods and the rudder was operated by cable. With the stick held back, the tailwheel could be locked for takeoff or landing, and with the stick forward, the tailwheel was unlocked for short-radius turns. According to FAA and sales records, the airplane was manufactured in 1952 and was operated by the Egyptian Air Force from 1952 through the 1980s. During a rebuild in 1990, the 700-horsepower Shvetsov Ash-21 7-cylinder radial engine and VIS-111-V20 two-blade constant speed propeller were replaced with a 1,350-horsepower Pratt & Whitney R1830-75 14-cylinder radial engine and a Hamilton Standard 3-bladed constant speed propeller. The fuel system was modified as part of the engine replacement. This included removal of the primer pump and hand fuel (wobble) pump, and installation of an electric fuel pump. On December 5, 1990, the airplane was classified by the FAA as experimental, and a special airworthiness certificate was issued in the racing, crew training, and exhibition category. According to maintenance records, the airplane's most recent condition inspection was completed on August 28, 2015. At the time of the inspection, the airplane and engine had accrued 318.5 total hours of operation. The 0953 recorded weather at AGC, about 8 minutes after the accident, included variable winds at 5 knots, 6 miles visibility in haze, clear skies, temperature 28°C, dew point 23°C, and an altimeter setting of 29.99 inches of mercury. AGC was owned by the Allegheny County Airport Authority and was a public tower-controlled airport. It was located 4 miles southeast of Pittsburgh, Pennsylvania at an elevation of 1,252 ft above mean sea level. The airport was equipped with two runways oriented in a 13/36 and 10/28 configuration. Runway 28 was grooved concrete in good condition, measuring 6,501 ft long and 150 ft wide. Examination of the runway and accident site revealed that, after the airplane traveled past taxiway C and entered the left turn, it continued to turn left for about 294° until it traveled off the runway pavement on a magnetic heading about 346°. The airplane then traveled across a storm drain and the airport infield about 612 ft before coming to rest. The metal and fabric fuselage skin in the areas of the cockpit, right wing, left wing root, and forward portion of the empennage were consumed by fire. The cockpit was completely destroyed. The remaining metallic skin on the outboard section of the right wing and empennage exhibited extensive thermal damage, including melting, oxidation of aluminum surfaces, and brittleness. The wreckage was sooted with areas of vertically-oriented re-solidified globules of aluminum aircraft structure. The tail section, engine cowling, and the left wing were intact. All three propeller blades displayed minimal damage with no evidence of a propeller strike. Both magnetos were intact on the front of the engine, and the rear of the engine displayed minimal thermal exposure near several openings in the firewall. Examination of the landing gear system revealed that the main landing gear was in the down and locked position. The brake disks showed no indications of overheating, pitting, or grooving. The brake calipers were intact and there was no sign of hydraulic leakage. The tailwheel was functional and undamaged. There was extensive fire damage on the aft inboard trailing edge of the right wing and adjacent areas. The right side of the fuel system engine feeder (sump) tank was also located in this area. The feeder tank had multiple areas of melt-through on the upper surface. The wing structure outboard from the sump tank was intact. The inboard edges showed signs of melting, sooting, and thermal discoloration of the remaining paint. A section of aircraft structure was also found separated from the wreckage which displayed evidence of broomstrawing on both ends, consistent with being subjected to shock loading while being in a near-molten state. Compression damage was discovered in the forward section of the right wing inboard of the right main landing gear, with portions of the airplane's tubular frame bent and displaced to the right side of the airplane's centerline. Flight control continuity was confirmed from the flight control surfaces to the burned-out section of the cockpit. The mixture control was full rich. The fuel shutoff lever was about 3 inches forward of the aft (shutoff) stop, the throttle was full aft (idle), and the propeller was in the full forward (full rpm) position. 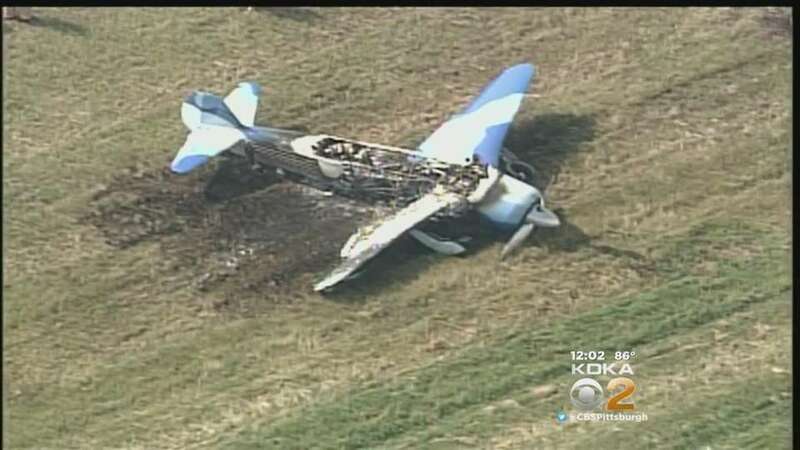 The Office of the Medical Examiner, Allegheny County, Pennsylvania, performed an autopsy on the pilot. Cause of death was superficial and deep burns combined with inhalational thermal injuries complicated by sepsis. The Office of the Medical Examiner, Allegheny County, Pennsylvania, performed toxicology testing of the pilot. The specimens from the pilot were negative for carbon monoxide, cyanide, basic, acidic, and neutral drugs, except for Fentanyl, Oxycodone, Midazolam, and Lorazepam, which were administered postaccident. Examination of published fuel system information revealed that fuel was carried in two main wing fuel tanks of 173 liters (45.7 gallons) each and a small sump tank of 13.5 liters (3.6 gallons). The two main fuel tanks were located in the inboard section of each wing between the front and rear spars. The sump tank was gravity-fed from the main tanks. From the sump tank, fuel would flow through the main fuel line to the engine-driven fuel pump then to the carburetor. According to information provided by the previous owner of the airplane, after a flight about 10 years earlier, fuel was discovered leaking from the fuel system. The leak was determined to be coming from a fuel pump with a leaky diaphragm, though the previous owner could not recall which one. That pump was then replaced with a "new old stock" fuel pump, which after installation and testing, was found to also be leaking. Another pump was purchased from another supplier, installed, and was found to work properly. Examination of maintenance records indicated that, 5 days before the accident, a mechanic had completed installation of a Garmin SL 40 VHF Communications Transceiver and a Garmin 250xl Transceiver/GPS navigator on the right side of the cockpit near where a transponder and step-down voltage unit had previously been installed. The mechanic had also fire-sleeved the oil and fuel hoses at the engine accessory case and fire-sleeved the oil and fuel hoses that were connected to the cockpit gauges. According to first responders, after the pilot egressed the airplane, when asked about what happened, he advised that he thought "a fuel line came apart," had "blew off," or "busted." Examination of the fuel system revealed that the pressure carburetor displayed minimal thermal damage, and the oil and fuel hoses located at the rear of the engine, though fire-damaged, did not display any evidence of breaks or leakage. Further examination of the fuel system revealed that the fire had been fed from the fuel system and appeared to have originated in the area of the right wing root where a fuel feed line, fuel return line, and a fuel tank vent line were located. Examination of the electric fuel pump revealed that the main body was intact and appeared undamaged by heat. One inlet had a small section of thermally damaged polymeric hose. Two small outlets showed evidence of thermal deformation, thinning, and melting. These signatures were consistent with exposure to high temperatures. There was no thermal damage to the main body of the fuel strainer and fuel shutoff valve unit. The outlet located near the top of the strainer section had a small section of aluminum fuel line still attached. The section end exhibited high temperature deformation on the fracture surfaces as well as some areas indicative of overstress. The inlet located near the shutoff valve section also had a small section of fuel line still attached. The section end exhibited melting and thinning consistent with exposure to high temperatures. Three sections of the fuel sending wiring exhibited end fractures consistent with mechanical breakage. Two of the wire sections had a twisted junction about mid-length. There were no signs of separations in the junctions and no sign of electrical arcing around the joined sections. There were no signs of electrical arcing, beading, or melting on any of the conductors of the 3 sections. A section of avionics wiring still had the connector attached. The opposite end exhibited fractures consistent with mechanical breaks. The exterior of the braided conductor surface was bare and exhibited an oxidized layer, both consistent with exposure to high temperatures. There were no signs of electrical arcing, beading, or melting on any of the conductors. The power wiring was routed along the right side of the cockpit in close proximity to the area of the right wing root. One section of the wiring displayed a fracture at one end; the other end remained attached to a portion of the main bus bar. The exterior of the braided conductor surface was bare and exhibited an oxidized layer, both consistent with exposure to high temperatures. Unlike the other wires, this section exhibited signs of arcing, beading, melting, and welding of conductors. According to the airplane's previous owner, the belly of the airplane was a large aluminum panel held on with fasteners. When removed, it would expose the electric boost pump, "fuel plumbing," rudder control cables, torque tubes for the flaps and ailerons, the center fuel tank, and "all of the items" under the pilot's compartment. The previous owner further advised that, when it was open, you could "touch the bottom of the seats." Examination of the remains of this area did not reveal evidence of any type of fire blocking or fire blocking materials such as a fiberglass liner, thermal-acoustic insulation, or fire-resistant barrier fabric that would have reduced heat and fire impingement in the area of the cockpit. According to Transport Canada ("Flight Suits-Functional Protection," May 20, 2010), one manufacturer of fire-resistant clothing carried out a burn test in order to rate the clothing materials that provided the most fire protection. Layering fire-resistant garments on top of each was determined to offer the best protection; with the results of the tests indicating that, when a Nomex 27/P flight suit was worn directly against the body, burns totaled nearly 52% body surface area (BSA). When a Nomex 27/P flight suit was worn with short cotton underwear, burns totaled about 34% BSA. When a Nomex 27/P flight suit was worn in conjunction with Nomex long underwear, burns were reduced significantly, to about 9% BSA. These numbers included unprotected head, hands, and feet, which could be protected by the use of fire-resistant boots and gloves, and a flight helmet worn with the visor down. 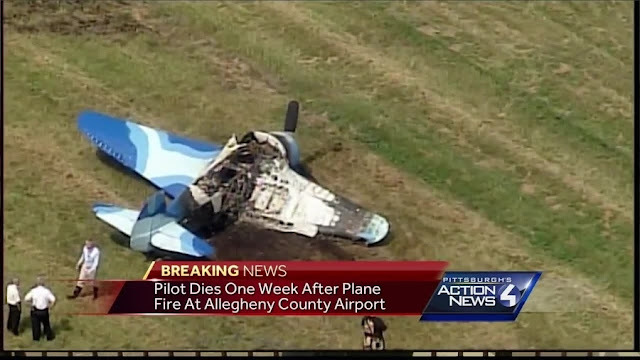 On July 25, 2016 about 0945 eastern daylight time, a Yakovlev Yak-11; N5940, was substantially damaged by fire after landing, at Allegheny County Airport (AGC) West Mifflin, Pennsylvania, The commercial pilot was fatally injured. Visual meteorological conditions prevailed, and no flight plan was filed for the personal flight conducted under the provisions of Title14 Code of Federal Regulations Part 91, which originated at Chester County Airport (MQS), Coatesville, Pennsylvania about 0830. The accident occurred during the first leg of a multiple leg cross country flight to the Experimental Aircraft Association (EAA) fly-in and convention (EAA Airventure Oshkosh), which was being held at Wittman Regional Airport (OSH), Oshkosh, Wisconsin. According to preliminary air traffic control information from the Federal Aviation Administration (FAA), and security camera video, the pilot first made contact with the airport control tower at AGC when he was approximately 20 miles to the east of the airport for landing. The pilot was then directed to "proceed straight in" for runway 28. The pilot was then cleared to land on Runway 28 at AGC. The pilot acknowledged the landing clearance and advised that he would be going to "Corporate Air" and would need "progressive" taxi instructions. During the landing, the airplane appeared to touchdown approximately 2,000 feet down the runway. The pilot was then advised by the tower controller to "make any left turn" and to contact ground control. The airplane then rolled past taxiway "C." The pilot then asked if he could turn around on the runway. He was given permission to do so, and to contact ground control. The pilot then advised he was switching frequencies to ground control. The airplane was then observed in a left turn. Moments later, as the airplane continued to turn to the left, the airplane's right side became visible to the personnel in the control tower, and the ground controller advised the pilot that "you have a fire under your wing." At this point, the airplane continued in the left turn until it traveled off the right side of the paved surface of the runway and rolled through the airport infield until it came to rest near taxiway "G." Smoke and flames were then observed to increase in size from the right side of the airplane. After the airplane came to rest, the pilot egressed and was observed standing near the airport windsock by airport personnel. He was then transported by golf cart to a nearby hangar where a helicopter emergency service operator was based. Paramedics began treatment of the pilot who had visible thermal injuries, had not been wearing his fire retardant flight suit, and was clad only in shorts and a T-shirt. He was then transported to the hospital where he succumbed to his injuries approximately 6 days later. Examination of the runway and accident site revealed that after the airplane traveled past taxiway "C," and entered the left turn, it continued to turn left for approximately 294 degrees until it traveled off the right side of the runway pavement, on a magnetic heading of approximately 346 degrees. The airplane then traveled across a storm drain, and across the airport infield for approximately 612 feet, before coming to rest. Examination of the wreckage revealed that the majority of the metal and fabric covering of the fuselage had been consumed by fire, and the right wing, and empennage displayed evidence of thermal damage. Vertical soot trails were evident throughout the wreckage along with numerous areas of vertically oriented solidified rivulets of metal alloy. Further examination also indicated extensive fire damage in the area of the aft inboard trailing edge of the right wing, near a section of "L" shaped alloy channel mounted along the wing root fuselage juncture, near the right side of the fuel system engine feeder tank. Compression damage was also discovered in the area of the forward section of the right wing, inboard of the right main landing gear, with portions of the airplane's tubular frame displaying displacement to the right side of the airplane's centerline, along with bending of some sections of the tubing which made up the airplane's tubular frame. Flight control continuity was confirmed from the flight control surfaces, to the burned out section of the cockpit. The mixture control was full rich. The fuel shutoff lever was approximately 3 inches forward of the aft (shutoff) stop, the throttle was full aft (idle), and the propeller was in the full forward (full rpm) position. All three blades of the propeller displayed minimal damage and no evidence of a propeller strike. Both magnetos were intact on the front of the engine, and the rear of the engine displayed minimal thermal exposure near several openings in the firewall. Examination of the landing gear system revealed that the main landing gear were in the down and locked position. The brake disks showed no indications of overheating, pitting, or grooving. The brake calipers were intact, and there was no sign of hydraulic leakage. The tailwheel was functional, and undamaged. According to FAA records, the pilot held a commercial pilot certificate with ratings for airplane single-engine land, airplane multi-engine land, and instrument airplane, and held a letter of authorization from the FAA to operate the Yak-3, Yak-9, and Yak-11, as pilot-in-command under visual flight rules. His most recent FAA second-class medical certificate was issued on April 5, 2016. He reported on that date, that he had accrued approximately 3,100 total flight hours. According to FAA and sales records, the airplane was manufactured in 1952 and was operated by the Egyptian Air Force from 1952 through the 1980s. During a rebuild in 1990, the 700 horsepower, Shvetsov Ash-21, 7-cylinder radial engine, and VIS-111-V20 two-blade constant speed propeller, were replaced with a 1,350 horsepower, Pratt & Whitney R1830-75, 14-cylinder, radial engine and a Hamilton Standard 3-bladed constant speed propeller. On December 5, 1990, the airplane was classified by the FAA as experimental, and a special airworthiness certificate was issued for the airplane in the racing, crew training, and exhibition category. 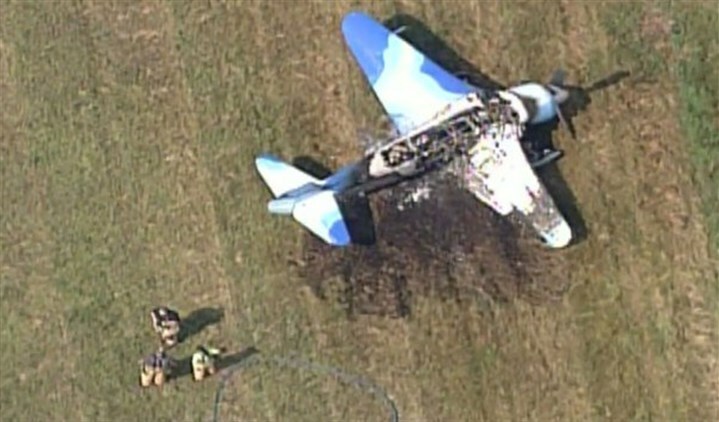 The wreckage was retained by the NTSB for further examination.